Are Wolf Protection "Kid Cages" Necessary? When I was growing up in Wisconsin, I would hear occasional rumors of kids in the Northwoods having to worry about wolves as they “waited for the school bus.” Why they would have to fret only Monday through Friday at a specific time of day always baffled me. There were never any actual news stories of children being attacked, of course, and such warnings became state folklore more than anything else. Most of Wisconsin’s early European settlers were of Scandinavian and German descent, and it stands to reason that they would bring their bogeymen with them and plant their seeds in the soil here. Such tales could also have been started by deer hunters, who, it seems, are perpetually convinced that having wolves in the state means less deer for them to hunt. Recently, however, I heard an even more astounding story coming out of New Mexico. In that state, “kid cages” have been built to keep children safe from wolf attacks as they, too, “wait for the school bus.” Is such a precaution based in facts, or is it yet another move to demonize wolves? In rural Reserve, New Mexico, children routinely wait for school buses inside boxy, chicken-coop-like, wood-and-mesh structures. These “kid cages,” as they are called, are specifically meant to provide protection from wolves. When the U.S. Fish and Wildlife Service recently proposed to cover about 75 Mexican gray wolves in New Mexico and Arizona under the Endangered Species Act—making it illegal to kill this subspecies of the gray wolf and expand the area where these wolves can roam safely—a long-simmering political debate came to a head. Conservative groups, which say that wolves pose a threat to humans and livestock, contend that the government is overreaching its authority. Wolf defenders, on the other hand, cite the fact that no wolf attacks have ever been documented in New Mexico or Arizona and call the kid cages a political stunt. According to Dr. Daniel MacNulty, an assistant professor of wildlife ecology at Utah State University who’s been studying wolves in Yellowstone National Park for 18 years, the probability of a wolf hurting someone is close to zero. A child in a rural area is more likely to be injured or killed in a hunting accident or in an encounter with an off-road, all-terrain vehicle or feral dog. There are very few instances in North America of wolves harming anyone, let alone children. In addition, states MacNulty, Mexican gray wolves weigh just 60 to 80 pounds, in contrast with Yellowstone wolves, which can be upwards of 130 pounds. For that reason, Mexican gray wolves are selective about what they kill, usually targeting only small, juvenile livestock. Even with adult prey, they mainly kill the older animals. 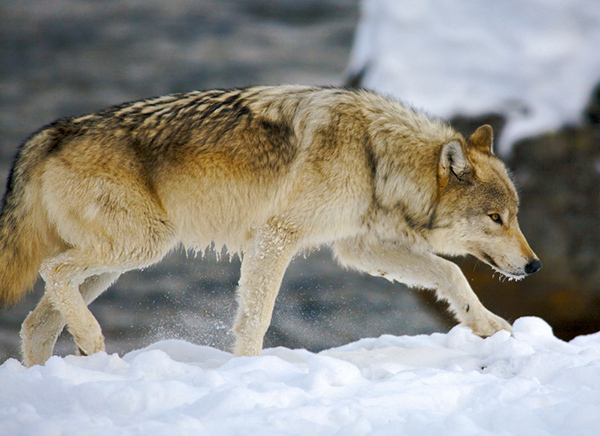 Researchers also point out that wolves in Yellowstone often run away when spotted in the field. Mexican gray wolves are generally even more leery of people, livestock and wild prey. And while it’s true that a pack of wolves is more likely to be bold than an individual, they don’t all contribute equally to the hunt when, for example, 10 show up. Only about four of them actually do anything; the rest are there to be on hand when a kill is made. As most of us know who have been fortunate enough to encounter wolves in the wild, it is a thrilling, safe experience. Because humans generally intimidate wild wolves, being able to observe their behavior—even for a short time—is a rare event. And here in Wisconsin, it’s becoming more uncommon all the time. Do you think the construction of “kid cages” in New Mexico is an overreaction to the presence of wolves, or merely a precaution worth investing in to ensure children’s safety? Perhaps a cage that keeps kids away from television and electronic gizmos would have a higher benefit/cost ratio. Between New Mexico and Arizona, there are a mere 75 wolves that live in expansive wilderness areas. The natural behavior of wolves is to shy away from humans. There have been no registered attacks on humans, as far as I know. “Kid Cages” represent negative propaganda meant to stop the repopulation of the Lobo its native habitats. However, hunters and ranchers want wolves GONE forever. These anti-wolf zealots have also equated wolf reintroduction to government overreach and want to make a statement by delisting them from ESA protections, confining their range and permanently destroy the reputation of wolves in general. No, “Kid Cages” are nothing less than a scare tactic and a sham. There was a serious project to re-introduce wolves into the Scottish highlands some years ago as a natural predator for the deer populations. It foundered in part because of the right to roam act and the inability of the landowners involved in the project to fence in a reserve area for the wolves. That such stupidity can be deemed serious by the general public and officialdom, says a lot about that community. (The same country that has the audacity to tap into the telephone conversations of the president of an allied country!). Some ten years ago a shark attacked and killed a surfer in False Bay near Cape Town. That made headline news in huge bold letters. Yet, about 17 000 people are killed annually on South African roads, roughly just as many are murdered, but one shark attack creates paranoia! And we human beings pride ourselves as being rational. No wonder the world is in such a mess! This is the stupidest thing I have ever heard! Of course, it is fearmongering and another way to demonize wolves–just like the old Russian stories of a troika racing away from slavering packs of vicious wolves. Wolves will go for human prey if they are starving–and their natural prey has been overhunted or killed by overdevelopment or fragmentation of habitat. But like the stories of attacks by pumas, attacks by wolves on human beings is extremely rare. In the UK we don’t have any wolves but we do have similar (albeit not so profound) scaremongering about urban foxes – sneaking into houses and eating babies, etc. However anyone who has tried to photograph them will know how timid and easily startled they are. I have to say I think domestic dogs, that some people allow to roam free in the street (or don’t close the gate to keep them in), are potentially far more dangerous and probably attack more people than any other animal in the world. It makes more sense to build kidcages against humans, as kids have to fear more from other humans beings, sometimes even their parents, then from wolves. Building kidcages against wolves has no justification, and only creates unnecessary fear and hate against wolves. Building kidcages against wolves has no justification, and only creates unnecessary fear and hate agains wolves. I have a place in West Yellowstone, Montana. Wolves, bears, mountain lions-you name it. 2 wks ago was walking a USFS road w/ my 2 dogs and a lone wolf came out if the woods, about 100 yards ahead, paused & looked at us, then went on its way. Had similar encounter w/ mountain lion, both last month. Grizzlies are more a concern than wolves. It’s all hype, wolf haters trying to spread fear, so that more people are outraged and join the fight against wolves. Seriously, you’d think there was a epidemic of these attacks, and then they drag out the “Think of the CHILDREN!” proclamation. Almost everything written about wolf attacks on humans is wingnut alarmism. They may happen, but they’re statistically insignificant. Gee, ya think its political, really? (sarcasm turned off now.) Moms today have to worry about kidnappers, paedophiles and now child eating critters. What dangers should they be concerned about, which are real and which are imagined, fueled by media hype/ignorance/ratings. That is not to diminish the potential for bad encounters with wildlife. Large carnivores -bear, cougar – have attacked and killed humans for a variety of reasons. Coyote attacks on small pets and children are on the uptick in the suburbs. But cages at bus stops? I heard those cages attract rattlesnakes … hee hee. I’ve photographed throughout Canada and Alaska, lived in Colorado and was there when wolves were reintroduced to Rocky Mtn Nat’l Park, spoke at length with outdoor writers from Cal Rutstrum to Andy Russell to Barry Lopez and as near as I know there has never been a properly documented case of wolves attacking people unless under attack themselves and cornered, including during seasons of poor prey for them. This is just old wives tales solidified into paranoia and ignorance gone to seed. Mountain Lions are a different matter, But I’d want to see the statistics (and hard evidence) on children ravaged by wolf packs before I bought into this. There was a period in Breckenridge, CO when feral dogs were causing a serious problem. Perhaps a large Malamute was mistaken for a wolf by an ignorant witness but it seems to me to be one of those situations where a typical politician is looking for a cause, any cause, through which they can establish some sense of dependency and therefore power over the people. It’s a scare tactic plain and simple. Unfortunate, and perpetuating myths that later can hurt the species. … So who invaded who’s territory first? — If one is pondering on moving in by the lake, and a child almost drowns… Empty The Lake??? Thinking of taking my Family on a Ski Trip this winter ( I live in South Texas) … Who would I Totally Blame if one of them breaks a leg??? It is quite sad that a lot of people would believe mythical stories rather than true facts. 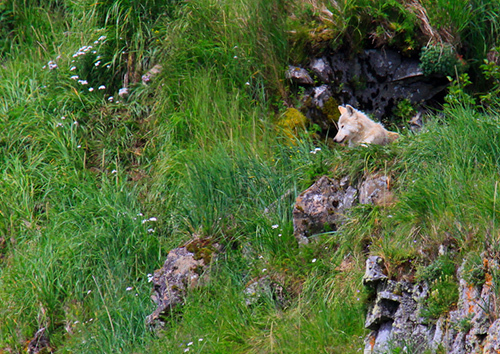 There is so much miss conception on wolves which can lead to harmful actions that can affect the wolf populations. Having spent at least 339 nights camping in a tent in the Mexican wolf reintroduction area in AZ and NM and having seen 43 of the animals in the wild since 1998, I think I can say with some confidence that the fear of lobos is definitely overblown. On those occasions when my companions and I have been fortunate enough to actually see Mexican wolves, the creatures have made themselves scarce as soon as they became aware of our presence. What I find particularly reprehensible is the fact that adults are instilling in children an unhealthy fear of wild animals—wolves in particular—for reasons that have little to do with the reality of the situation. Ahhh, why not? The cages could protect them from rabid dogs and coyotes which would be much more likely an occurrence. If I were waiting on a bus there I would point out the fact that chickenwire does not work well on keeping out rain! The wolf is terribly dangerous; here in Europe we see hundreds of people every year dragged off by these slathering monsters. Not! This is just another example of political rectitude and ignorant stupidity of officialdom combined with the fear of litigation if there was ever a case of child injury through wolf attack. In all the years I have stalked wolves the biggest problem has been to get close enough to them to photograph; for some reason they have a very pronounced fear of man. Wonder why that is? I have NEVER seen or heard of a wolf attack – unprovoked – on a human, though I expect the scaremongers can drum up hearsay about thousands of episodes. It is this sort of stupidity that is causing un-necessary concern in the vast mass of ill informed public who as a result demonise the wolf and call for culling and control. They would be better off controlling some breeds of dog that are far more likely to injure a child than a wolf. This scaremongering is also aimed more generally at keeping the American people in a perpetual state of fear. Anyone remember the lesson in Bowling for Columbine? ”Who’s afraid of the big, bad wolf?…” It’s a scare tactic if you ask me. But maybe the kids will be safer from human predators? Unfortunately, wolves have always been made out to be the bad guy when it comes to human/wildlife interactions. Earlier in my life, I was a field biologist with the wolf recovery project in Northwest Montana, (Glacier National Park and the Bob Marshall Wilderness Area), and the Red Wolf Recovery Project, (Smoky Mountain National Park, Tennessee), and have personally witnessed amazing situations that simply nullify any credibility that wolves might harm humans. Of course, with all canines, there is a chance that a diseased or rabid wolf could create some issues but this is an astronomically remote possibility. The fact is that a wolf has the capability of tracking and culling out the sick, injured and ill members of a flock or herd and has no desire to attack healthy creatures…human or wildlife. I personally witnessed a healthy white-tailed deer hold off an entire pack of Yellowstone wolves without any difficulty. The deer was so relaxed in the presence of the wolves, that it frequently stuck its head into the snow looking for forage. When the wolves got too close or made an attempt to attack, the deer simply took a defensive posture and pushed the wolves away. Wolves just simply do not want to mess with any living creature, human or otherwise, that might cause them to exert unnecessary energy to gain a meal. There are literally thousands of documents from tissue samples taken from wolf predation remains that have clearly shown that wolves can actually detect the existence of disease in their prey. Take this biologically proven feeding information along with the fact that there are no reported instances of any wolf ever attacking and eating a human and the fact that the New Mexico grey wolf can only reach a maximum of about 65 pounds in size, makes these “kid cages” a political effort to sway the publics opinion about wolves. My opinion is that someone is using fear to advance their personal political agenda. A healthy and knowledgeable child who has grown up in a remote or wilderness type area where wolves are present will probably never even come into contact with a wolf. And even if a wolf showed an interest or curiosity in a child waiting for a school bus, the child could easily chase the wolf away or hold the wolf at bay with a stick or a few rocks. Wolves just do not want a confrontation with a human any more than a human would. This information is based upon multiple personal experiences and observations in some very remote areas regarding wolves. Wildlife should be a beautiful experience to be enjoyed and not feared. Enjoyed this story. Makes me glad, though, that we don’t have wolves in New England–at least not four-legged ones. How many children in New Mexico (or elsewhere) have been attacked by wolves? While waiting for a bus? Perhaps a few of the “law makers” need to be educated (or caged?). It sure sounds like scaremongering. Over the last several years, we’ve averaged about 30 people killed by domestic dogs per year in the U.S., and a sizable proportion of the victims were children. I can find no records of an attack on a human by a Mexican wolf (the kind in New Mexico) in the last century, same for wild gray wolves in the lower 48. If these people are really worried about their kids’ safety, they should have been building dog-proof “kid cages” long ago. The cages are more a statement of hate and ignorance rather than devices that address a real problem. 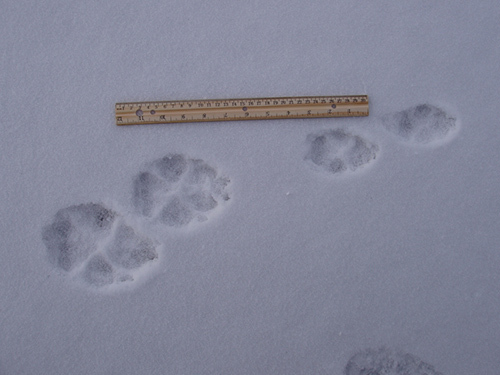 Wolves are truly scary creatures – there is nothing like being on your own in the wilderness and coming on the trail of a pack of wolves – the paw prints are as big as my hand! That being said, I spent many weeks alone in the wilderness with wolf packs and have lived to talk about it. The kid cages are probably unnecessary. As Joel said, they are much easier than education. Great care, however, needs to be taken in the approach to subject. Do no harm is a good motto here. Rather than attack the cagers, infiltrate and educate ala’ George Bernard Shaw, and you can’t be blamed if and when a wolf injures someone (as could be the case in a too-direct antim-cage campaign). I love reactionary ill-informed steps to appease vocal minority groups – much cheaper than education. since we’re talking bus stops, why hasn’t anyone thought of cages to protect them from idiot drivers and creeps. That is a more likely hazard, isn’t it? It definitely makes you predict a scenario. This is absolutely unbelievable, putting kids in a cage to protect them from the big bad wolf. I have also heard of some ridiculous stories, from northern Wisconsin,where people claim that wolves were hanging out by school bus stops in order to steal the kids sandwiches. I have spent a good share of my life in the outdoors looking to observe and photograph wolves and have had little to show for my efforts. I guess I should have been waiting by a school bus stop with a couple of sandwiches in my pocket. I think it so sad that humans have this unrealistic fear of wolves… they’re such glorious creatures.